Our baby girl is going to be 11 months old in 3 days. I can't believe we're about to hit 1 year. So much has happened in such a short amount of time. 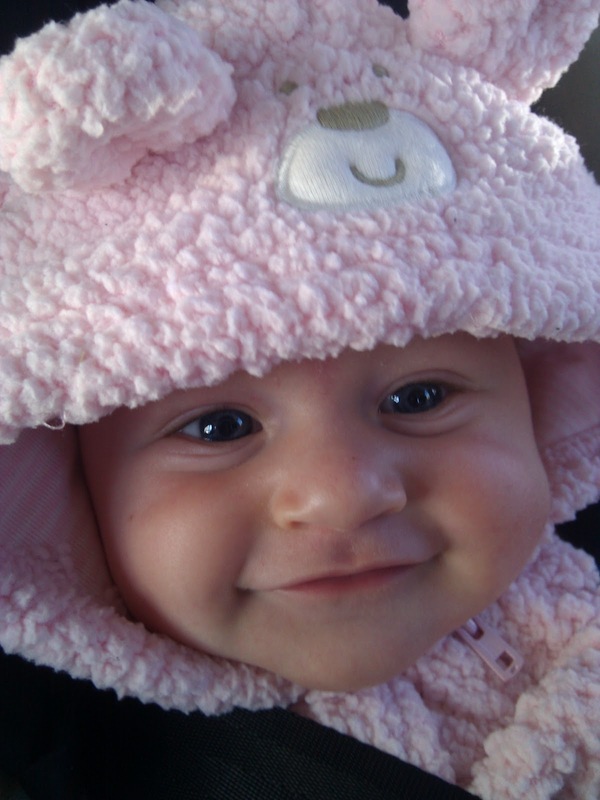 It's incredible how much things change every couple of weeks when you have a baby. Life is constantly adjusting. Right when something gets easier, something else is more difficult! But overall, everything is so wonderful and Ella has been such an amazing baby. And I hope very much that her demeanor and attitude remain the same throughout her toddler years as well! The biggest thing has been my experimentation with cooking and baking. We definitely eat much better now that I stay home and I love seeing new recipes turn out deliciously in my kitchen. I would love to try my hands at some crafts as well, but haven't gotten to that quite yet. So I keep to my cooking, Ella, the house and helping Philip with some of his projects. As we continue to evolve, I believe this blog should as well. "Ella Pearl" is about Ella of course, but I feel it also represents our new lives as a whole and how they continue to change in our activities, purpose, etc. While I don't want to make a grand statement of commitment to the blog and exactly how it will change and evolve over time, I do think it's time that it's allowed to become a creative outlet in conjunction with our musings and memories about its namesake. My passions and ideas are slowly growing and they include things that consume my stay-at-home mom lifestyle...parenting, cooking, baking, decorating, parties, gifts, crafts, girly stuff, organization, etc. So new blog posts from me will be about those things along with my Ella updates for my own creative release and also hopefully helping or encouraging others who stumble upon this little blog. 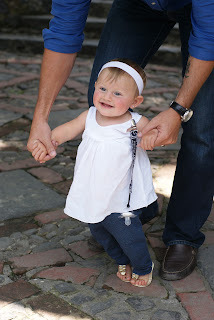 We took our first big trip with Ella in July for 3 weeks in Mexico. The first week was in Cancun for a nice beach resort vacation and the rest of the trip was spent in Mexico City visiting my family and exploring the city since Philip had never been. Traveling with a 9 month old was not completely terrible and Ella was as good as she could have been. She loved getting to eat so many new foods (as she had just given up baby food before we left) and getting so much time strapped to Daddy on the Bjorn! She is now an expert swimmer as well with so much time spent in the pool. Dad checking in here - Ella just had her nine month check up last week. It was a moment Kiana and I were anxiously awaiting. She is getting so big. Literally growing by the week. So many amazing things have happened since we've last written. 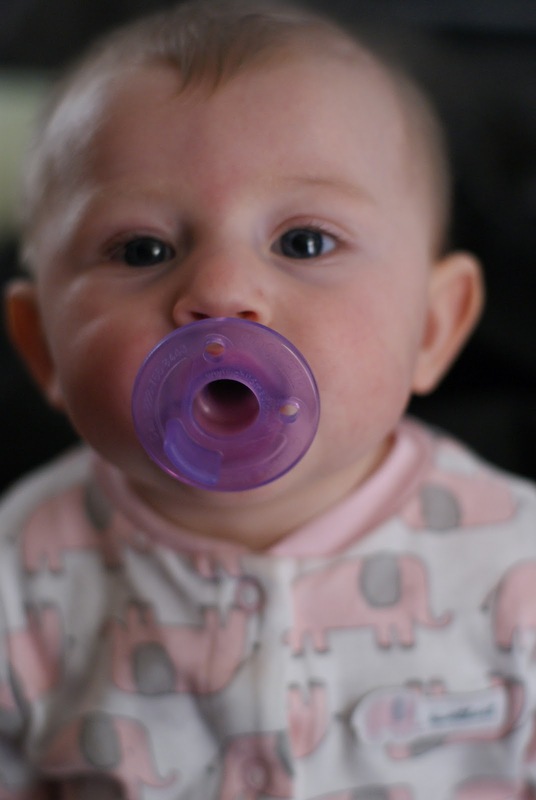 In rapid achievement Ella learned how to stand up on her own, share items she is holding, how to crawl - everywhere, feed herself with her two new teeth and drink straight from a baby cup with a straw! Best of all she is now putting together early signs of ma-ma and da-da. Kiana and I are enthusiastically overjoyed. She even plays with our other children, of the furry variety, Tyson and Kobi. They lick her face and she screams in utter delight at the wonderful sensation of cold sandpaper with a dash of slobber. To say the last three months have been amazing is a wonderful disservice to how I actually feel. I find myself searching the internet for various toys for her - not sure if they are more for her or me! I think about her constantly and love the FaceTime sessions we have together when Kiana calls in on her iPhone or iPad. If Kiana wasn't already a stay at home mom I would be first in line to be a stay at home dad. I love being around my little Ella. The thought of her brings a smile to my face as I write this. I'm amazed at the job Kiana has done with her - like her true calling in life was never to be a super-powered ad exec of the Mad Men variety, but that of a kind-hearted, patient, loving mother. She is caretaker of the most precious gift either one of us have ever received. The gift of life. Right now Ella is both a gift and our life. I wouldn't change a thing. Ella is just over 5 months old now! I can't believe we're about to hit the 6 month/half year mark. She has grown so much and learned many new things in the last month or so. She is so interested in everything - she reaches out to grab anything and everything she sees. She's especially fond of the iPads and cell phones. Her own toys rarely keep her engaged for long as she wants to get her hands on everything Philip and I are using...and then ultimately in her mouth! She's still as happy as ever, although gets bored and lets you know it sooner than she used to - an effect from being interested in everything. She sleeps roughly 10 or so hours through the night right now so as long as Philip and I go to bed at a decent hour, we get good sleep as well! I'm still exclusively breastfeeding and will discuss introducing solids at her 6 month doctor visit. I have a box of rice cereal already waiting in the pantry! 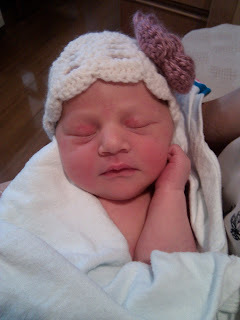 September 26, 2011 at 12:13 p.m. She was 8 lbs. 4 oz. and 19 in. 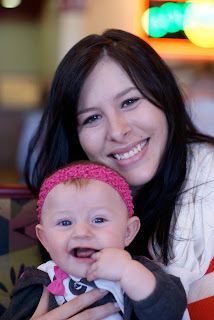 I wasn't sure if I'd continue blogging after her birth and I obviously haven't in 4 months! I've been better at keeping everyone up-to-date via Facebook with many photos. But maybe I'll come back here every so often for some more expansive thoughts and recaps. I was supposed to return to work on January 2nd of this year, but a week before Christmas, Philip and I decided that I'd quit and be a stay-at-home mom! We weren't sure if we'd be able to do it this early, but I'm so glad we are. I've so enjoyed the last four months with Ella. She is absolutely amazing and Philip and I love her times a million. My labor and delivery went rather smoothly, especially considering the other two friends of mine who just had their baby boys both ended up having c-sections. I was thoroughly exhausted since I went into labor (my water broke) at 11pm while getting into bed for the night. So I ended up not sleeping until the following night. We had a great experience at the hospital and it's been wonderful being home. Celebrating the holidays was wonderful, especially with my parents living here now and we are enjoying the beginnings of 2012! 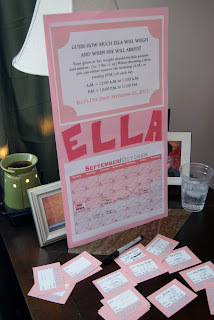 I'm very behind on recapping our Atlanta Baby Shower...it was such a nice get together with all our friends here. Our good friends Mary, Bree and Lauren hosted at Mary and Jason's house on August 6. There was a great spread of food. 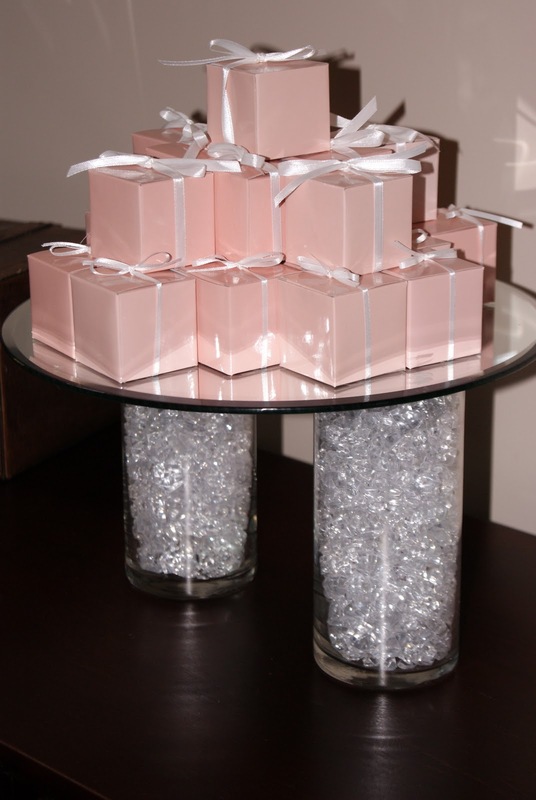 And the little candy boxes for favors were adorable. The glasses they stood on were lit from the inside. There was also some baby food on another counter for people to try and guess what flavors they were. There weren't many people willing to participate haha, but of those who did, no one got all of them right. Ryan snuck away while we were opening gifts to get his taste predictions in. We all just hung out and chatted which was great because we had been very busy lately and hadn't seen everyone in a long while. Vicky, Philip's sister, came with our 3 nephews as well. Philip with 2 of our nephews, Nate (left) and Troy. While hanging out in the living room, there were blank white bibs and paint set out for people to create their own designs. 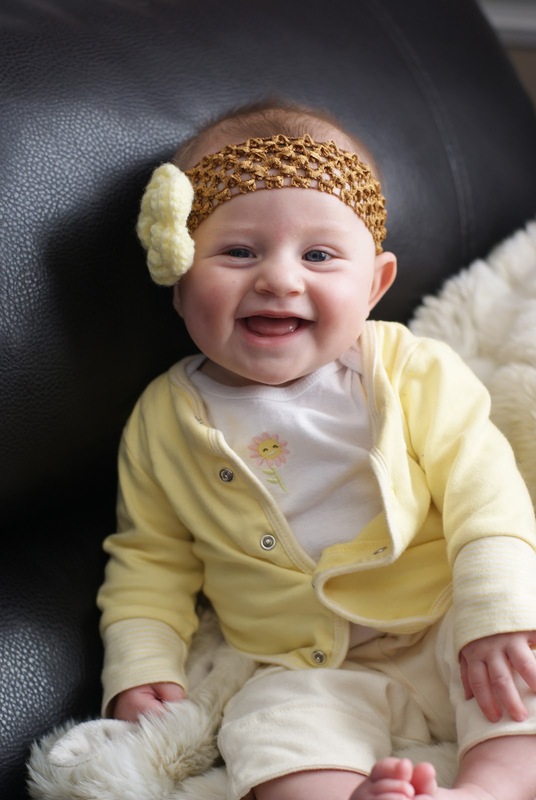 We definitely do not have a shortage of bibs now! Some of the designs were super clever and cute. Jason made the one on the left - Landon is their baby's name who is due 3 months after Ella. Allison, my friend from work made the one on the right. Lauren made this bib - she's an accountant haha. Also in the living room, there was a calendar made by Mary for everyone to guess Ella's birthday, whether it will be the AM or PM when she's born and how much she will weigh in pounds and ounces. After a while, we got to opening presents. We were blown away by everyone's generosity...and their good taste in clothing! Jen, who unfortunately couldn't make the shower, gave me her gift bag a couple days before at lunch to open with everyone - it was stock full of embroidered, monogrammed clothing: these bloomers, 3 sack dresses, a bib and a burp cloth. Plus, she got us a couple more pieces of clothing and the book "Go the F to Sleep" which I had been wanting - it's hilarious! Philip wanted hand puppets badly - he's very happy. After presents, it was onto the beautiful cake! It was a delicious Publix cake, but Bree made the "Ella Pearl" sign - she's so talented - it really made it unique. After all the official festivities were over, we relaxed and hung out with a few of our closest friends. We even had story time with our new book "Go the F to Sleep" with Philip and I taking turns reading aloud. It was a great laugh and great end to the shower. We're so fortunate to have so many friends who are just as excited for Ella's arrival as we are. I've been making weekly doctor visits for the past month. The past two weeks I've been 1cm dilated. This week I'm 1.5cm, almost 2cm and Ella is properly positioning herself to come soon. My due date is now back to September 25th. My doctor has "no idea" where she would have gotten the 29th from. This makes me feel as though she is extremely flaky, making these due date mistakes, telling us one thing and then another and then back again. There was no reassessment due to my physical condition. This simply was a mistake/miscommunication. I just can't figure out HOW that happens...she's so put together and professional otherwise. While an exact date is not a big deal because of course it's not an exact science, it does affect the decision of timing on the off chance we need to induce because she is not coming on her own. My doctor seems very confident I will naturally go into labor and says I'm tracking well for my due date. We do need to be prepared, though, just in case, so Philip and I need to decide what the deadline is for waiting and the date we'd go to the hospital so I can be induced. While my doctor recommends only going a week past my due date, she seems flexible to allow for longer than that. October 9th is exactly 2 weeks past my due date and as far as any doctor would let me go. We haven't discussed the date yet and I feel we may end up with a compromise...not 2 weeks, but maybe a little over a week as I want to give Ella the time to come naturally. I write this blog post at 4:30 in the morning, due to waking up at 3am for my nightly bathroom break. I'm always parched and drink some water before climbing back into bed and lightly falling back to sleep. But this time there was no water at my bedside and after going downstairs, dealing with a calf muscle cramp as I woke up and making sure the dogs were as quiet as possible, I'm awake after an hour of trying to sleep again. Now at the end of my pregnancy, these types of occurrences are less and less rare. I wake up once in the middle of the night to go to the bathroom. I don't sleep well in the morning - it's light, dreaming, erratic sleep that does not leave me well-rested. Along with sleeping issues, my mobility is definitely limited - I think pretty hard whether I want to sit and slouch down on the couch because it's not the easiest task getting back up. I stopped wearing heels permanently mid-August; my feet were getting just too swollen by mid-day and who wants to see that anyway in a cute pair of heels? My Nike flip-flops with great cushioning have become my new favorite shoes and are definitely showing the wear of that. An itchy stomach (who knew that was a symptom?! ), shortness of breath from lungs being crushed and a very achy neck, shoulders and back are a few of the other wonderful parts of being almost 9 months pregnant. My entire pregnancy has been pretty smooth sailing, though. I suppose if I didn't have any discomfort, at least at the end, that would be very weird. My only worry is that when I finally can wear all my fabulous heels again and dress in my regular clothes, where am I going to go? The grocery store? I am 36.5 weeks pregnant. We officially have less than a month to go before Ella's due date. My belly is.....big. It's funny walking around my office building, my client's office building and being out-and-about on the weekends running errands. I've never received so much attention from strangers before in my life - forget low cut tops in college, all you need is a big pregnant belly and all eyes are on you - men and women! It's like they can't help it. They don't try to hide it either - they deliberately look at my large stomach. It's as if they feel it's ok because it's not a permanent state that I am in like being morbidly obese or having a deformity - it's a special, temporary state, so, suddenly it's ok to stare. People automatically smile at you when they notice your huge stomach, whether they're simply passing you while walking and see you coming for a while or if they suddenly look up in the store and you're near them - instant smile flash. I've wondered what exactly about my appearance makes this reaction so instantaneous, so genuine. I don't think it will be the same once we're actually carrying the baby in the outside world. It's as if there's this quick moment of reality that sets in of the grand sense of life..."That woman is going through months of carrying a small, new human inside of her body. She's procreating. She's what makes our race, the human race, keep going." That's how deep I feel these strangers' enthusiastic and penetrating reactions are to seeing me at this state in my pregnancy - it's constant. They really shouldn't because it inflates my ego. I am very, very important - I am carrying LIFE. Not only do I receive countless, non-conversational smiles, but people feel compelled to talk to me about my pregnancy. Usually they simply ask when I'm due and/or what I'm having, a boy or a girl. Everyone is so curious and so interested in me. While I'm used to seeing myself everyday, I suppose I have to remember that the majority of the population does not see over 8 month pregnant women all the time. Most of the time women engage me - ones who appear older, who have all most definitely have had kids before themselves (trust me, you can tell by the knowing look they give you), but some men have engaged me as well. I feel very popular, like I have something great that other people don't have right now - but it's different than the stereotypical high school sense of popular. These people aren't jealous of me. It's popular in a nice, good way. People like me, even if for just the quick moment of communication we have. I believe they feel connected to me in some way - they're comfortable. I've gotten a random hug and belly rub from two separate strangers. I want to tell them "Why are you touching me?? I don't know you!" but they are just overly kind and I don't think they're thinking. You wouldn't normally go up to a stranger and hug them or touch their stomach, would you? No. So I have many more encounters than in my pre and mid-pregnancy life with people I will never talk to or see again about this all-important impending event in Philip's and my life. It's as if I'm sharing this little piece of me over-and-over, telling the same information to different people. "I'm due end of September. "; "I'm having a girl. "; "Yes, I'm beginning to be ready for it to be over." "You know, I don't think about being pregnant every waking second of my life. I do feel like myself - it's still MY body. Sure I constantly recognize all the annoyances, but that's just my reality right now. I am simply someone who struggles to bend down towards the end of the day when I have less energy. I am someone who has to strategically think of the best way to take off my jeans and get into my very high bed at night. I am someone who struggles to shave my legs and thus, do it less often. My stomach is a source of inconvenience in my life right now. I know that, but I don't dwell on it. It just is. I don't know anything different right now. Will I be excited to lay on my stomach while sleeping and for massages again? Most definitely. Do I look forward to being able to breathe normally? Move normally? Look normal? Not have swollen feet? Yes, yes, yes and yes. But I have to wait...just like every other pregnant woman there ever was in the history of the earth. And I am ok with that."